Not being a “breaking news” site, I am generally happy to sit back during the various festivals of our people such as this week’s San Diego Comic Con and enjoy the coverage from those on the ground, and then throw in my own observations and reactions after the fact. If you’re looking for some great resources to check out what went down, I’d recommend Michael Crawford’s MWCToys for comprehensive photo coverage (and thank him for the photos in today’s post), AFTimes for a great range of video, Action Figure Insider for articles and interviews and Toy News International for a good hub of galleries and links. I’ve had a particularly quiet SDCC as I’ve been down for over a week with a nasty bug - kind of like getting “con crud” without going to the “con”. I was counting on the serdendipity of time zones and the news from SDCC to give me something enjoyable to wake up to each morning, especially on the day of Mattel’s DC Panels. After some lacklustre waves in one of my favourite lines, DC Universe Classics, I was hoping for some happy news about the line’s future. What I woke up to was a storm. One of the great things about the internet is the provision of almost instant news, especially when there are a bunch of tech-savvy fanboys and girls on the ground! The challenge that comes with that level of access is working out where to begin and how to wade through the mountains of tweets and blog and forum posts to make sense of what’s actually happening! Needless to say the news an opinions after Mattel’s DC Panels were running thick and fast! The initial reactions I read seemed to be announcing that DC Universe Classics was dead, with the Club Infinite Earths Subscription (news of which had leaked out in the preceding days) the only way of accessing future releases, IF the subscription gets enough support. Some sites ran with this idea, and having now watched the video of the panel, I can understand why. There was a bigger message to get out, but it wasn’t communicated well at the panel. Wave 20 (featuring Hawk & Done, a hooded Green Arrow, Red Arrow and a Nekron CnC) ill be the last line of DCUC at retail as we know it. 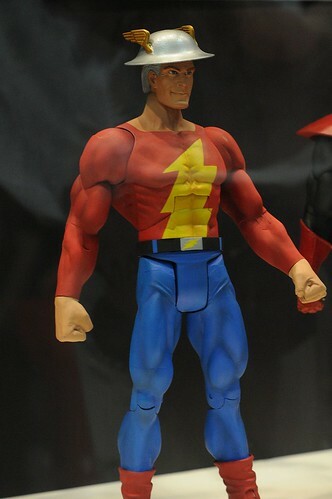 The Club Infinite Earths Subscription (if it proceeds) will contain a monthly figure (starting from April 2012 with Starman) and three oversized figures, which replace the Collect ‘n’ Connect figures. So, what’s my take on all of this? For starters, I think we have to accept that Mattel is probably scrambling to come to terms with the implications of the DCnU in the same way that we the fans are, and some of the lack of clarity has to rest with that. The confusion caused at the SDCC panel was unfortunate to say the least, but I appreciate that the Mattel team made time for the various interviews which have somewhat cleared the air. I’m reading quite a few people that are saying “We’re not like those MOTUC collectors - we won’t buy things sight unseen.” You know what? Maybe “we” need to be a bit more like MOTUC collectors, enthusiastic for whatever is produced. Look at how that line is thriving, and how the depths and breadths of possibility are now being explored because of the fan’s commitment to that line. Perhaps, to get the things we dearly want, we need to be prepared to work with something like a subscription program that gives everyone a chance to get what they want. Naturally, Mattel would need to show some signs of their willingness to cover the breadth of demand that different subscribers will bring to the party, and I do think that the first three figures (Starman, Jay Garrick Flash and Atrocitus) are a sign of that. Having held the MOTUC sub for two years now, I’ve been very happy with the experience and have also enjoyed getting some figures that I wouldn’t have otherwise chosen, so I will definitely sign up for the first year to see what comes of it. The potential for what the Four Horsemen could do with the oversized figures (very keen to see Metron as the first subscription figure too!). I’m also prepared to have some patience and faith that the line that gave me characters like Killer Moth and Kamandi at retail could deliver some even more amazing things online! I’ve struggled with this post long enough and I need to get it published so that I can move on to other things. There are more points to be made, and as always I’m keen to hear your thoughts! Next up I’ll be back to my usual un-timely reviews and stories, but you can let us know your thoughts on the state of DCUC and the sub in the comment section below (and of course to enter the July AFB Comment of the Month Contest), and can also vote in the poll on the right as to whether or not you’ll be signing up for Club Infinite Earths! Some good thoughts there, for sure. I agree that the best bet that we have of getting what we want is being open to other ideas and characters. I almost think we will be seeing more and more sub lines from Mattel in the next few years. I'm not a big enough DCUC fan to sign up for a subscription when I don't even know what I'll be getting beyond a few figures. I don't think there's any line I'd be willing to subscribe to under such circumstances. All I want now from a 6 inch DC line are more of Batman's rogues gallery, anyway. 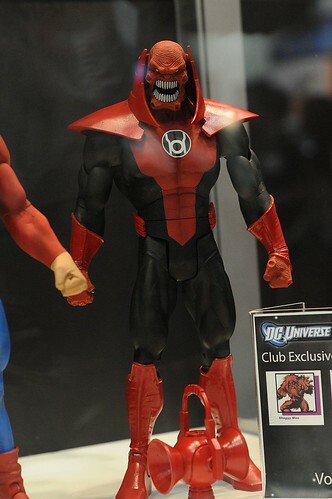 As much as I wan an Atrocitus, I can't justify paying over $250 (Does that include shipping? I feel like it doesn't.) for 12 figures when I'll probably only want a quarter of what's produced.